ATLANTA– February 3, 2011 – In the spirit of Oprah announcing this week that Monday’s at Harpo Productions are now meatless, Moe’s Southwest Grill doesn’t want the rest of us to feel left out! The fun and fast-casual restaurant supports Meatless Monday with its commitment to flexible, healthier menu options. The latest studies show that at least 7.3 million Americans are vegetarians and another 22.8 million are part-time vegetarians who like to change it up. At Moe’s, we don’t ask. Instead we offer it all, so all diets are equally satisfied. For vegetarians, the days of eating nothing more than rice and lettuce are over. Veg-heads are at home at Moe’s with six meatless options right off the menu, including delicious grilled marinated organic tofu and the popular “Art Vandalay” vegetarian burrito. If you want to stand out from the crowd, order up your own unique meatless creations with over 20 fresh vegetarian ingredients and toppings, like homemade guacamole, black beans and pico de gallo. Even the cheese and sour cream are free of gelatin and animal rennet, and all meats and veggies are cooked on separate grills. To our flexitarian friends – you know who you are: the part-time veg-head who won’t commit and prefers to dabble in both camps, Mondays at Moe’s are for you. In addition to Meatless Mondays, rest easy knowing that you could choose chicken that is all-natural, cage and hormone-free; steak that is 100 percent sirloin, grass-fed with no added hormones; and the slow-cooked pulled pork which is grain-fed, hormone and steroid free. No microwaves, MSG, trans fat or preservatives here. 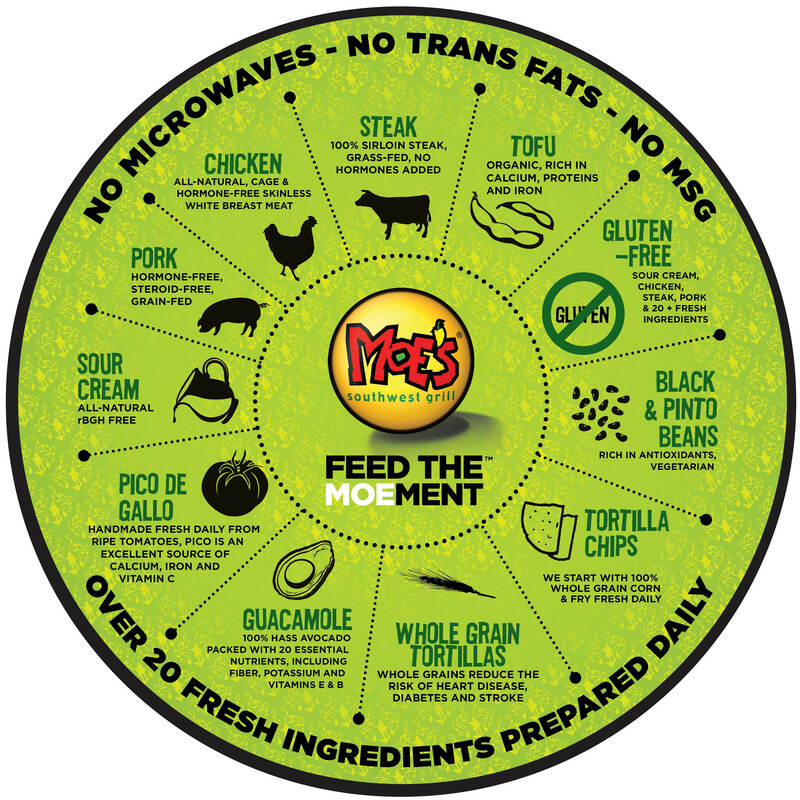 Moe’s online nutritional calculator at www.moes.com can break it down for you. ATLANTA, GA – Jan. 24, 2011 – Moe’s Southwest Grill, the fun, engaging and fast-casual restaurant, has made its own New Year’s Resolution. Starting today, Moe’s redesigned menu boards will feature a new food mission wheel “steering” guests to select delicious and healthy choices. Showcasing even more healthy menu options than ever before, Moe’s makes it easy for the whole family to make smart and tasty ordering decisions. We’ve ALWAYS known, but did you? Moe’s has always had the highest standards. Never having used microwaves, animal fat, lard or MSG, Moe’s offers guests nothing but the best with over 20 fresh ingredients including hormone-free grilled chicken, beef and even organic tofu. No gluten? No problem. Offering more than 20 gluten-free ingredients, Moe’s allows those on a gluten-free diet to indulge like never before. 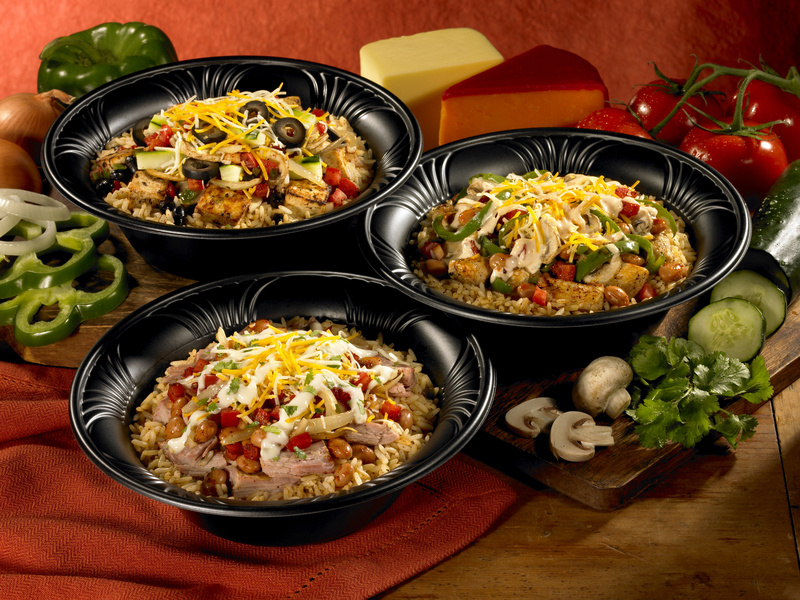 Delectable and customizable menu options range from burritos to rice bowls to salads. With the growing number of Americans affected by gluten allergies, Moe’s chicken, steak, tofu and pork are all prepared gluten-free and ready to be devoured at a “Moe-ment’s” notice! Attention Veg-Heads! The days of eating just rice and lettuce when out with friends are now over. Look no further than Moe’s where vegetarians are VIP. Not only are the shredded cheese and sour cream free of gelatin and animal rennet, but the grilled onions, peppers and mushrooms are prepared on a totally separate grill from the meat products. Organic grilled marinated tofu provides a tasty protein option, accompanied with any number of fresh produce and black beans or a side of freshly prepared pico de gallo. Lightening up? Feel good and show-off your choices at Moe’s with an entire menu of calorie-conscious options showcasing drool-worthy meals less than 450 calories. Salads or burritos featuring tofu or chicken, crisp produce, fresh salsa and grilled veggies easily fit in with a healthy eating lifestyle. Moe’s online nutritional calculator at www.moes.com provides additional support for those who want to further slice and dice their menu options! Flexitarians Unite! The newest diet option – be flexible about when and where you choose to be vegetarian or a meatatarian! Not only catering to those with special dietary needs, Moe’s also offers self-help in the form of a burrito for those simply looking to incorporate a flexible, yet tasty and healthy eating plan. Moe’s guests are guaranteed delicious and fresh options whether just dabbling in vegetarianism or on a gluten-free or low-cal diet. Moe-tivated! Moe’s thinks the world of the planet and is mindful of environmental impact and nutritional content. Serving food that sustains resources with the best possible option is vital to Moe’s ideals and company practices. Whether Moe’s is encouraging franchisees to purchase produce locally, provided Moe’s safety and quality standards can be met, or serving cage- and hormone-free chicken and grain-fed pork, Moe’s tries to do the right thing by the animals and the earth – and its customers.